These rescued kittens are living the dream – eating, napping and playing all day. Toss in a live audience, and they are the envy of everyone in Hollywood! 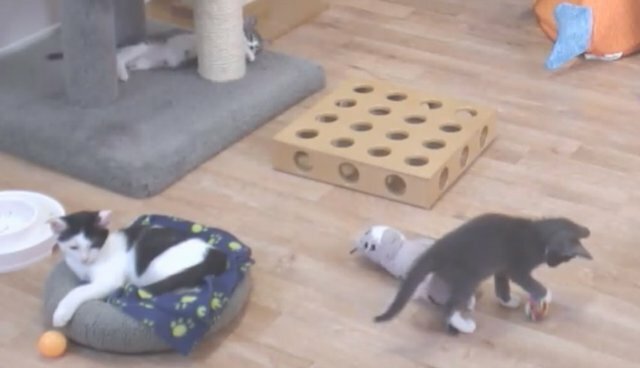 What you are watching: The Kitten Rescue Homeless Cat Sanctuary is a private, no-kill shelter located in Los Angeles, a city with major overpopulation challenges. Every year, over a million cats who don't find a forever home are euthanized. But Kitten Rescue houses approximately 150 of the lucky ones at any given time. Most are adoptable. Best viewing hours: 5 a.m. – 12 a.m. (Pacific Time). If the video is not live, click here to view other Explore.org livestreams. To learn more, visit Explore.org and click here to support Kitten Rescue Los Angeles.